Happy Pongal (now a wee bit belated)! Pongal, or Sankranti, is an Indian festival that celebrates the winter harvest of rice–a staple food of South India. We celebrate with two kinds of festival foods–ven pongal, or a spicy savory rice and lentil risotto-like dish and chakkara pongal, a sweet brown-sugar and cashew-laden variety. Since it’s sugar-free Jan for me, I did away with the chakkara pongal this time. While I’m not that big of a rice eater (sorry my South Indian peeps, I’m just not that into rice), I always remember around Pongal how much I like the dish. And just how easy it is. This year, my husband suggested that we do something different–turn it into a portable appetizer we could take wine tasting with us. within a few mins, I had an idea: I’ve seen/heard of arancini, sicilian risotto balls. I decided this could be a good way to have pongal. I made mine a little healthier than the normal pongal by doubling the lentils in the recipe. I also threw the whole thing in the rice cooker–no fuss, no muss. 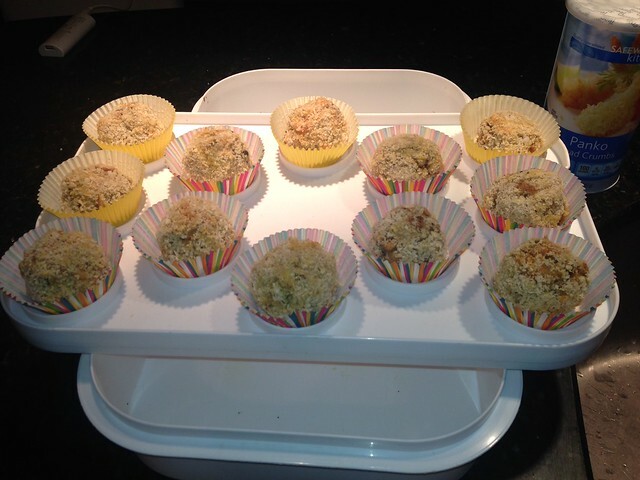 And healthier than the normal arancini by baking rather than frying. Put all of the ingredients into the rice cooker (just 1 pat of butter and none of the cashews) and let it go. I turned it on and went to bed. When I woke up, I stirred, and voila, we had pongal. Almost. While that’s cooking, heat up your butter in a skillet. let it sizzle. You could use ghee but I don’t routinely have that laying around (did I just lose my desi card again? twice in the same post?). Dump that ontop of the pongal mixture and enjoy. Best enjoyed when piping hot. Bake at 350 for about 10-15 mins. You want your coating to get a little brown and a little crispy. 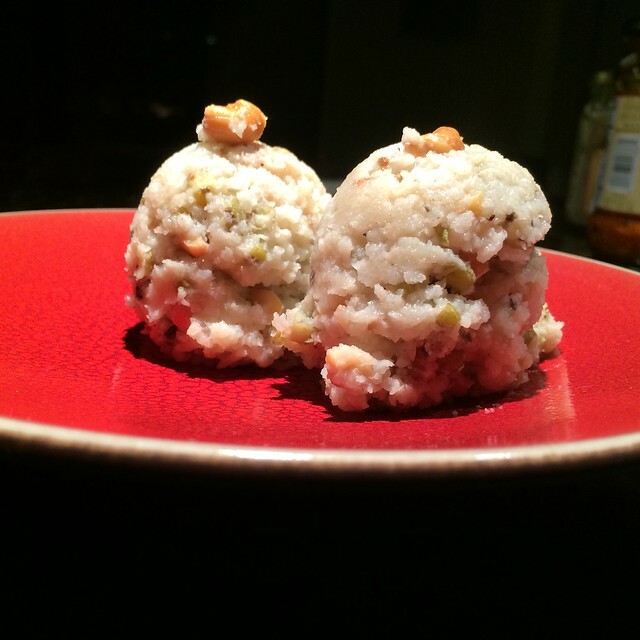 This entry was posted in main dish, Recipes, vegetarian and tagged arancini, lentil, pongal, rice. Bookmark the permalink. I am a rice eater and yours is a unique recipe. I’ll surely try it out.